I Feel The Time Is Ripe To Post. The furore over the YouGov poll this weekend has filled me with glee. Our Government Establishment and their fading, unrepresentative charlatans in Westminster and Whitehall deserve the kicking a Yes vote would deliver. Sure any divorce is painful but who could argue the ability to leave a bullying, arrogant and very unpleasant partner, masquerading in London as having their serfs best interests at heart, is an ability to be envied. By the same token, how marvellous if we could have a referendum to get divorced from our real and equally ghastly crowd in Brussels. An organisation run by the whim and manipulation of a Germany desperate to rule the Continent more solidly than their blitzkrieg efforts allowed a few decades back. Back to Scotland. The very fact a Yes vote will rid us of 40 odd Labour, grasping MPs and pretend socialists, would be glorious. 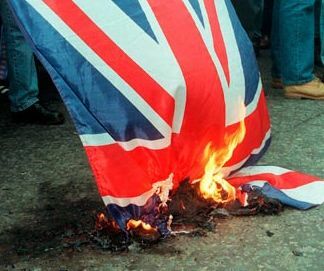 An England/MUK, (mini UK) with a chance of many years of conservative rule. Common sense breaking out and a Nation reverting to the Country it once was. Out of the EUSSR, civil servants paid on genuine results and a Parliament brought back under control. Certainly one that doesn't keep milking the indebted Exchequer for yet more salary increases and unearnt expenses. As for the future of an Independent Scotland, I'm less confident of a successful outcome. A likely scenario would be the early need for financial bail out. Ergo a Greek rather than Norwegian solution, led by the EUSSR and their reserve bank, the IMF. Full euro membership probably the only way or route to secure funding. Then we would witness an "out of the pan into the fire" future, after just a brief flirtation with any real independence. I will revert once more to another possible benefit for MUK. The savings to be made from no longer having to placate a restless population would more than make up for lost oil revenues. Not least because much of the future reserves lie outside Scottish geographical influence. A reduction of six million citizens and the proportional number of pension and benefit liabilities would also give the remaining Entity savings. Naturally I know no more than anyone else what the future will be if Yes wins the ballot. My gut feeling is No will still win on the day. However the panic breaking out still remains a wonderful spectacle. Especially when you realise Snotty Gordon would be chucked out of our Parliament. What's not to like, I ask myself! Whatever the result, I wish only the best for the Scottish people but fear independence might not be the right outcome. Time alone will tell. Re the flag. Please insert the flag of St Alban in place of the flag of St Andrew. I have a nice White Dragon flag that looked very well in the Arena on one Last Night of the Proms.